Exchange 2010 introduced several high availability and disaster recovery features, the one that receives the most publicity is the Database Availability Group (or DAG for short) feature. In short a DAG allows replication of a mailbox, to other servers in the DAG, that can be activated automatically within 30 seconds, restoring user access to their mailbox’s. For more information see my article series on DAG’s here. Here, the green copies are the Active Copy, they are the one’s users are actually accessing for their mailbox’s. The yellow and the red are copies that can be activated, should the Active Copy go offline. Consider the possibility that MDB01 on server NYMB01 goes offline, the copy on NYMB02 would be activated within 30 seconds automatically. Next, the drive holding the database MDB01 on server NYMB02 fails, causing THIS copy to go online. In this case, the copy of MDB01 on DRMB01 in Boston would be activated with 30 seconds, and users would be able to access their mailbox’s, across the WAN link to Boston! This is all part of the design of the DAG, and is great from a High Availability standpoint. But, as we know, High Availability and Disaster Recovery are COMPLETELY separate. High Availability means to provide your users with high uptime, or access to the application. Disaster Recovery is the ability of the application to function when a catastrophic event happens, such as destruction of a datacenter or worse, the building holding the datacenter. This last part, is what we will cover in these articles. To do so, there is a feature of DAG’s that we need to talk about, and that is the Datacenter Activation Coordinator, or DAC. NYMB01, NYMB02 and DRMB01 are all part of the same DAG, lets call it DAG1, and all these servers are located in the NYGIANTS.COM domain. Now, our DAG fits the criteria for DAC mode, which is three or more member servers, spread across multiple Active Directory Sites. So, now what is DAC mode? DAC mode is, quite simply, a mechanism to prevent the possibility of a split brain in your exchange environment. Consider the following scenario. As per the first diagram, you have MDB01 and MDB02, and both active copies run in NY on NYMB01 and NYMB02 respectively. NYHT01 is running the file share witness. A file share witness is a server that only participates if the DAG has an even number of servers, it’s used to “break” any tie in voting regarding if a server is down or not. The NY site is connected via WAN connection to Boston, where DRMB01 hosts replica’s of MDB01 and MDB02. Say there is a cut to the WAN connection, and for whatever reason, NY and Boston can no longer communicate, but neither side is truly offline. 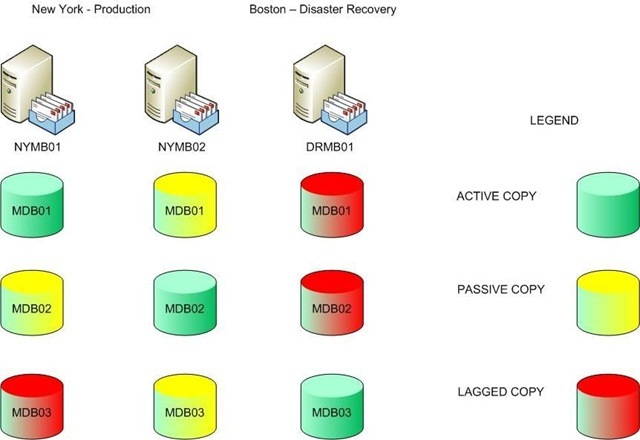 The Boston side, since it can no longer connect to the NY server’s, assumes they are down, and mounts the database copies it has of MDB01 and MDB02, and marks them as active. Since NY is still operational, it STILL has its copies of MDB01 and MDB02 mounted and active. This is a split brain scenario, both sites believe that they are the rightful owner of the database, and have thus mounted their respective DB’s. This would cause a divergence in data. For example, if outside user, sends an email to a user at nygiants.com, and its received in NY, it would get delivered to his mailbox in NY. If another user sends the same user at nygiants.com an email, and it gets received by Boston, it would get delivered to that’s users mailbox in Boston. Each mailbox is different, which is a huge problem, this is the issue with a split brain scenario, and is what DAC was built to protect against. So, DRMB01 dismounts MDB03, which is mounted and activated in NY. This is how the split brain scenario is avoided. So what does this mean if there really is a need for a datacenter failover? At one site I work at, there was a broken pipe in the tenant above them, causing a flood that threatened to destroy their datacenter. If the datacenter had been destroyed, how do we activate DR? We’ll go over that in Part 2 of this series. For this article, we discussed mainly the theory and thought process behind DAG’s, Datacenter Activation Coordinator, and the concept of Quorum with regards to the cluster. In the next article, we’ll jump in and do an actual datacenter failover. What would happen should the WAN link between the sites fail? 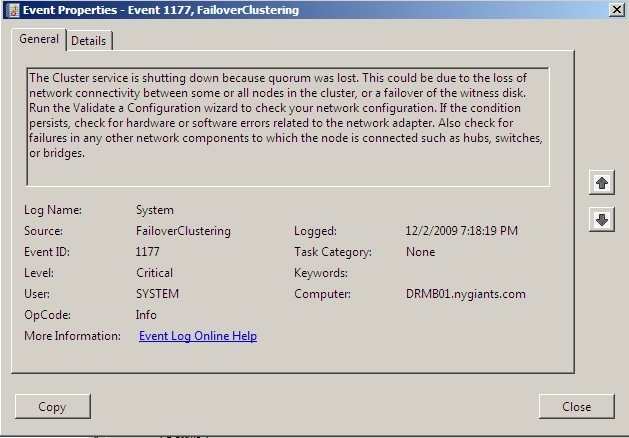 Would the site containing the witness server decide that it now had quorum and make all of the databases active that were previously active in site 2 and would the site 2 servers take all of their databases offline? I have presume you have DAC enabled in this configuration. We have 4 servers in DAG (1+3 copy of DB). Two servers in Site A and two in Site B. We have 2 CAS/HUB server in each location with FSW (File Share Witness) configured on Hub server. We are planning to failover database from Site A to Site B and shutdown all the servers in Site A. I need to know how to move FSW from Site A to Site B. Will there be any impact to DAG if we shutdown Site A. Basically we are planning to do DR test. Any suggestion would be appreciated.